To say we’re “re-watching” Attack of the Clones is a tad misleading as I, like most of you, re-watch all the films on a regular basis. So, the fact is it wasn't that long ago that I watched Star Wars: Attack of the Clones so a revisit wasn’t entirely necessary, but I'm a professional and did it anyways! If you've been part of the Star Wars fandom for any length of time then deliberations involving the merits of this film have been discussed ad nauseam. Nevertheless, it's the anniversary so here we go! Yes, there’s probably nothing in over 41 years of Star Wars media that has been more prone to mockery and ridicule than this line delivered by poor Hayden Christensen. It’s clear here Lucas is comparing the two trilogies and the technology limitations he encountered with the original, holding them up side by side. It’s no secret he yearned for the technology available to catch up with his imagination and when he did, he foolishly relied too much on it to tell his story. What is “soft and smooth” are the original trilogy scripts which by the time the films hit the screens were polished and fluent. It took many hands and many rewrites to get that way, but they feel purposeful and earnest and if you look at Empire Strikes Back, plot holes aside, is full of rich dialogue both expositional and romantic in nature. A portion of that success must be attributed to the actors who delivered their lines with gusto and honesty, even though they didn't always understand what they were saying. The dialogue in Episode II however exists solely to advance the plot and provide necessary information, and its clear Lucas couldn’t escape his willingness to show off his deep love and roots in mythological themes, political point of view aside. Almost undecipherable at times, it’s no wonder it didn’t reach a wider audience as the themes of love and betrayal are lost in a wash of all too Star Wars specific vernacular. If you’re not in on the skinny, then frankly you’ll likely get a little bored, because the performances aren’t good enough to keep you in the game. In a film whose purpose is to literally and figuratively give us the Clone Armada that we’ve heard and read so much about, it’s too bad the stiffest performances came from its leads, Anakin Skywalker and Padme Amidala, played of course by Hayden Christensen and Natalie Portman respectively. I will say, both performances dramatically improved by Episode III and provided many stand out moments, especially in the dramatic scenes. But that’s Revenge of the Sith, not this film. In a script that sways back and forth between banality and deep-rooted mythology, it’s no wonder some of the performances seem slow and formal. “Flat” is a word used to describe the delivery of most of the dialogue, especially during the scenes between Anakin and Padme, and that’s because it appears they are speaking matter-of-factly, not with true earnestness. It’s well covered territory that the actors struggled in front of the green screens and we also know Hayden Christensen and Natalie Portman are definitely not untalented. So whatever the reason it’s clear something is amiss and its unfortunately the most memorable thing about Attack of the Clones as the burden is on these two to carry the film. The actors speak more slowly than they might, factually, formally, as if reciting. Sometimes that reflects the weighty load of the mythology they represent, at other times it simply shows that what they have to say is clichéd. There’s far too much bleakness in the script and that doesn’t help with intonation and tonality. Remember, these two are supposed to be falling in love with each other but they seem to be just tolerating each other's company in some sequences as they recite the many consequences of their doomed relationship and forbidden love. The images and scenery in this film dangerously approach indistinctness and at times seemed to undermine their potential power. There’s far too many completely CGI sequences that wash out any finer details the advancement in technology would normally handle with ease. Lucas is clearly still tinkering with hand to mouth when it comes to the technology and you can see how by Revenge of the Sith he had become very comfortable with writing along side of it, not despite it. This is most evident during the battle sequence on Geonosis towards the latter half of the film which should have been a spectacle of awe inspiring action but is at best a dizzying array of special effects. It’s here we see more Jedi on screen than ever before, the death of Jango Fett and the first example of the clone army engage in battle led by Master Yoda. It’s a remarkable sequence involving almost every single main character, dizzying blaster fire, lightsabers, giant creatures and explosions going off in every corner of the screen. 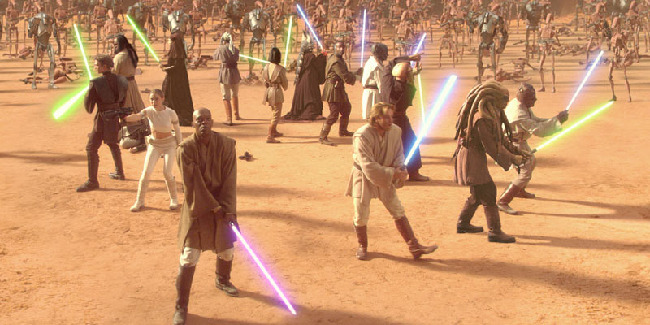 Immediately after, the battle moves outside of the arena onto the fields of Geonosis where the Separatist Droid Army battle the Republic’s Clone Army. It’s incredibly difficult to discern what’s happening in some shots and the actor’s are so clearly standing on a sound stage it’s very distracting at times. They are constantly unaffected and unaltered by what looks like a brutally inhospitable environment and backdrop. It’s not all bad however as the film does contain some quality stuff from Ewan McGregor, Christopher Lee, Samuel Jackson and Ian McDiarmid. Obi-Wan’s side mission to discover the truth behind the Clone Army on Kamino and his engagement with Jango Fett is a wonderful play of events and McGregor is more than up to the challenge. The environments on Kamino are wonderfully conceived and the rainy backdrop made for an intense first encounter between these legendary characters. In fact, McGregor throughout the film is dependable and reliable, delivering his lines with a twinkle in his eye and a farcical approach that you can't help but smile when he's parlaying with the others, whether it be scolding Anakin or trading barbs with Dooku. It gives us our first live-action representation of Count Dooku aka Darth Tyranus, who is elegantly played by the steady and charmingly evil, Christopher Lee. As Dooku reveals the sinister plot by the Emperor he is of course forced into a showdown where he gets to display his formidable skillset which includes Force lightning! His late in the film one on one with Yoda is a highlight for sure, albeit an ever so slightly underwhelming debut of a poorly rendered Yoda in action. Also, the confrontation between Count Dooku, Anakin and Obi-Wan which precedes the Yoda skirmish, is a wonderfully choreographed and executed fight sequence. The results of which had a lasting impact into the greater Star Wars universe that was felt for many years to come. However, these moments are few and far between as too many times the film is hijacked by plodding scenes such as Anakin’s return to his home world of Tatooine and the Zam Wesell pursuit sequence through Capital City on Coruscant. Here, even away from Padme, Anakin can't seem to be the leading man Lucas needs him to be. What's nice about Attack of the Clones is that it does end on a high note, much like its predecessor The Phantom Menace, with a wonderfully tasty cliffhanger. It left things in such a precarious and foreboding manner that you left the theater with a feeling of pure dread in the pit of your stomach. We would be forced to wait three years to see how the beautiful mess that Anakin and Padme created for themselves would play out and whether Lucas could end his trilogy with a bang. These movies are certainly an event if nothing else and even this weaker entry into the saga proved to be eyebrow raising in the end. Attack of the Clones, like the prequel trilogy in general, rewards those who are patient and it's no coincidence that the final sequences in each of the three films is the series' best. When coupled with Revenge of the Sith, its easy to see this film as purely a set-up for the final act of the prequels and whose sole purpose is to deliver the information you'll need going forward. In that respect, this film succeeds entirely. Whether that was the intention of Lucas or not is up for debate I suppose. But whether you like it or not or how it ranks on your personal list of Star Wars films, Attack of the Clones is obviously here to stay and remains an important entry into the franchise to this day.